TACLOBAN CITY – The Department of the Interior and Local Government (DILG) Region 8 on November 5, 2014 will honor persons who showed uncommon bravery and selfless commitment to others during and after Super typhoon Yolanda (Haiyan) last year. The Yolanda Heroism Awards will be held at 1:30 PM on November 5, 2014 at the Ritz Tower de Leyte, Tacloban City. According to DILG-8 Regional Director Pedro A. Noval Jr., this seeks to acknowledge people who risked their lives for others and to glorify exemplars of courage and selflessness. To be recognized for Acts of Valor are security guard Dionesio Bagon, a resident of Palo, Leyte; Christopher Caspe from Magallanes, Tacloban City; Armando Corillo from V&G Subdivision, Tacloban City; Benjoe Mercenes of Taguiktic San Jose, Tacloban City; and Isagani Sabalza of Brgy, Magay, Tanauan, Leyte. For Acts of Good Samaritan the honorees are Nilda Quiero of Philippine Red Cross, C/insp. Adel Bautista of the Bureau of Fire Protection, and Ranel Repasa from Tanauan, Leyte. The honorees were screened and validated by DILG and agency partners from the Department of Social Welfare and Development (DSWD), Department of Health (DOH), Department of Education (DepEd) and Kapisanan ng mga Brodkaster ng Pilipinas (KBP) Eastern Visayas Chapter. They were originally nominated by people whom they rescued or who witnessed their deeds, and endorsed by parish priests and municipal/city mayors where the deed happened. Agency representatives will introduce the honorees, and present the award together with Dir. Noval and UNDP Yolanda Response Team Project Manager Eden P. Garde, who will give the Inspirational Message. Short videos featuring each honoree will also be shown. DILG-8 plans to open a social media page that will allow others to share similar stories of heroism and sacrifice during Typhoon Yolanda to help inspire more people. Winners will receive both plaques of citations and a cash reward. “The storm which was the strongest ever to hit land, tested the resolve and character of the people. The award is a fitting tribute to the individuals who performed extreme acts of selflessness and sacrifice during and after Yolanda,” said Dir. Noval. PARIS – Model and entrepreneur Jessica Minh Anh officially transformed the symbol of the fashion capital, the Eiffel Tower, into the world’s newest catwalk on 31 October 2014. J Autumn Fashion Show marked Jessica’s 8th history making showcase around the globe and promoted the rise of a new generation of creative leaders. Jessica Minh Anh in OM Fiore design at J Autumn Fashion Show 2014 on the Eiffel Tower. With a vision that goes beyond imagination, the innovative show producer presented a two-tiered outdoor catwalk, which spanned over 150 metres across the first floor of the symbolic tower. Models led by Jessica Minh Anh catwalked through the iconic corridor surrounding the tower before appearing in front of 150 exclusive guests. To enhance the experience, Jessica Minh Anh made full use of the tower’s brand new feature as models stepped on the thrilling glass floor at the end of the catwalk. The panoramic views of Trocadero, Champs de Mars, and over 100 exquisite designs from Europe, Asia, and America were strategically captured for live audiences worldwide. “It was definitely a historic moment. Another flawless presentation by Miss Anh” said Alan Williams, UPS’ front man, who also attended Jessica’s famous Tower Bridge catwalk in London in 2011. Similar to Jessica’s previous unconventional catwalks, J Autumn Fashion Show 2014 combined art, culture, architecture, and fashion. Participating brands embrace tradition, yet experiment various techniques of modern designs. Bahraini powerhouse Dar Naseem AlAndalos opened J Autumn Fashion Show 2014 with a French fusion collection. Emphasizing on fashion-forward detailing, the mother-daughter team told the story of luxurious Parisian women through their fifteen elegant long tailed dresses. The show continued with another representative from the Middle East, Saudi Arabian brand OM Fiore, who blended Arab embroidery threads into European fabrics. Thanks to the artistic touch by designer Omaymah Azzouz, the brand successfully premiered a modern Abaya collection, which mixed warm summery colours with darker tones of autumn and winter. Next in line was Indian talent Shilpa Reddy, who brought edge to the grand catwalk with bold colours, well-formed structure, and distinctive cuts. The most significant look inside the collection, worn by Jessica Minh Anh, combined a fitted military inspired blazer with sharply padded shoulders and royal-styled trousers. It stood out as a statement for strong independent women in the ever-evolving today’s world. Going back to classic, Danish brand Soul Made Faroe Islands presented an authentic knitwear collection inspired by Nordic heritage. Debaj from Qatar further beautified the catwalk with Parisian floral art embroidered on finest organza and chic velvet. All the way from Canada, Sho Sho Esquiro added Native American vibe to the catwalk with interesting elements such as gold beading, abalone, seal, carp, and beaver tail. The vibrant 8-piece collection truly reflected the deep connection between the designer and her land. The surprise addition to Jessica Minh Anh’s catwalk was the 17-year-old American talent Kate Walz, whose fabric manipulation techniques sealed her place in the show. Kate’s collection focused on handcrafted sculpture, draping, and whimsical detailing, which were highlighted when the gowns were in motion. “Kate represents the daring new generation who choose to experiment” said Jessica Minh Anh. Haute couture designer Hoang Hai closed the show with class and extravagance. Pushing the creative envelope, the Vietnamese talent presented a smooth transition from cloud-like elegant dresses with lace, chiffon, and floral motif, to floor length hand beaded gowns with transparency and architectural elements. The final masterpiece, which embodies femininity and radiates modern beauty, was designed with Jessica Minh Anh as the inspiration. Wearing her Eiffel Tower inspired hairstyle, the model appeared like a vision in Hoang Hai’s dream-like white dress and Montblanc’s signature white diamond bracelet and ring ending the historic catwalk. The red carpet event welcomed country ambassadors, luxury buyers, global 2000 company directors, international fashion designers, and the press. Guests were treated with freshly made Italian breakfast by Pozzetto before taking their seats at Dyson-heated VIP area. The show was also supported by Before Beauty Bar, Acanthe-Sol, Lyric Hotel, and Unexpected from Paris as well as Fridja, Intricate Creations, and Elite Marking in London. On her decision to host J Autumn Fashion Show 2014 on the Eiffel Tower, Jessica Minh Anh said “I see a strong connection between fashion and the best of locations. The most exquisite designs should be displayed at architectural masterpieces” She added “Eiffel Tower represents an artist’s dreams, and inspires their many creations. I wanted to make those dreams attainable”. She definitely did. At the incredible speed of three-month preparation per show, Jessica Minh Anh is set to continue to reach new heights and claim the sky. Prior to hosting the world’s highest fashion show on the Grand Canyon Skywalk and America’s most iconic catwalk atop One World Trade Center, Jessica Minh Anh produced fashion phenomena’s on London’s Tower Bridge, PETRONAS Twin Towers’ Skybridge, Gardens by the Bay’s Skyway, and Costa Atlantica’s sundeck among others. MANILA – Greenpeace today called on the scientific community to step up its support for ecological food production to build resilient agriculture that can meet the threat posed by climate change and ensure food diversity and nutrition security. The call was made on the final day of the 4th International Rice Congress (IRC) held this week. Cotter said that in times of extreme weather events like droughts, floods, and typhoons, communities need resilient agriculture that will continue to provide food and meet their nutritional needs. It remains difficult, however, to predict when droughts or floods will occur and while plant breeding can provide climate tolerant varieties, farmers do not always know which variety to plant. “Diversity holds the key to climate change resilient farming by providing an insurance policy against the impacts of extreme weather,” Cotter added. In Thailand, the debate on genetically modified organisms (GMOs) was sparked again on October 21, just a few days prior to the IRC, when the country’s Supreme Administrative Court dismissed a case filed by Greenpeace against the Department of Agriculture for negligence in the management of the department’s genetically engineered papaya field trials in Khon Kaen province in 2004. While in the Philippines, there is growing resistance among local scientists, farmers and consumers on GMOs like ‘Golden’ Rice, created and marketed to developing countries like the Philippines as a quick-fix solution to eradicate Vitamin A Deficiency (VAD) among children and solve world hunger. Despite the hype and decades of research and development, there is still no scientific proof that ‘Golden’ Rice will indeed solve VAD. Kasarian-Kalayaan, Inc. (Sarilaya), an NGO working with women farmers, is strongly against GMOs such as ‘Golden’ Rice because they encroach upon peoples’ rights to healthy food and a healthy environment. GMOs will only worsen, not solve the country’s food and nutrition issues. “We, at Sarilaya is for the promotion of sustainable production and consumption. We want to ensure that the next generation will live in an environment that is healthy and safe, giving importance to environmental stewardship,” said Margie Lacanilao of Sarilaya. “Solutions to food insecurity and nutritional deficiencies are already available; including the fortification of food, Vitamin A supplementation, and diet diversification sourced from ecological agriculture. These solutions should be supported through policies that will enable farmers and the industry to pursue ecological agriculture instead of the illusion of GMOs, which will only divert resources away from solutions already available,” said Daniel Ocampo, Greenpeace Philippines Ecological Agriculture Campaigner. “Aside from resilience to climate change, ecological agriculture ensures ecological diversity and can be a source of diverse diets that assures a healthier source of nutrients for people,” Ocampo added. Despite the interests of some industry members in producing new genetically engineered rice strains, Marker Assisted Selection (MAS) is by far ahead of any genetically engineered rice being developed. Several rice varieties developed through MAS are already helping farmers cope with abiotic stresses such as drought and salinity. Unlike genetic engineering, crops produced through MAS do not present risks to farmers or traders resulting from GMO contamination. KAC Youth Instructor Gabriel Lamparas (background, sixth from left) facilitates the introduction of camp names to participants of the Sacred Heart School-Ateneo de Cebu personal leadership training. CEBU CITY – More than 300 high school students from the Sacred Heart School - Ateneo de Cebu underwent a personal leadership training facilitated by Ramon Aboitiz Foundation Inc - Kool Adventure Camp (RAFI-KAC), with the last batch finishing theirs last October 21 to 23. The program aimed to develop the participants’ leadership and decision-making skills. The first two batches of students underwent the program last August and September, respectively, while the third and final batch did so this October. “I have learned to be more supportive to my peers and to myself. I also learned to take risks and trust in my capabilities. 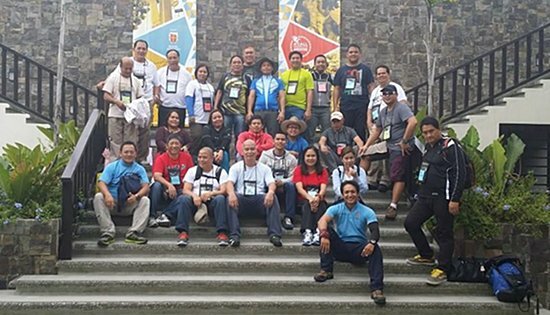 I can apply my KAC learning in all aspects of my life by stepping up and being more responsible and considerate to others,” said Jose Joaquin Baronta, one of the participants. 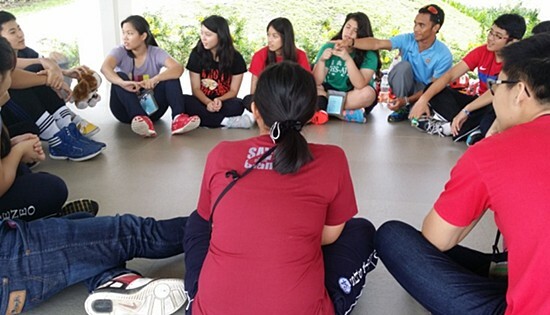 The program is an introductory course for SHS-AdC high school students. Having partnered with the school, KAC is considering a higher level course for these participants in the coming year. KAC is one of the programs under the Ramon Aboitiz Foundation Incorporated (RAFI) Leadership & Citizenship focus area, where future leaders are nurtured to prepare them to take an active role in affecting change. RAFI’s other focus areas are Integrated Development, Micro-finance & Entrepreneurship, Culture and Heritage, and Education. KAC has been offering adventure education programs for leadership and team development for youth and professionals for the last decade. It has recently opened the Philippines’ first fully dedicated adventure education center last August 2014. Like the Sacred Heart School - Ateneo de Cebu students, those from other schools, both public and private, could also avail of KAC’s services. For more information on KAC and its services, contact 260-9000 local 1001 and look for Althea Santillan, or visit www.kac.rafi.org.ph or www.facebook.com/kooladventurecamp, or follow @rafiorgph on Twitter. Bureau of Customs employees have their photo taken with their facilitators after completing their synergy program facilitated by the Ramon Aboitiz Foundation Inc - Kool Adventure Camp (KAC) Professional Development Program last September 9 at the Balamban facility of KAC, the first fully-dedicated adventure education center in the Philippines. PSupt. Carlo M. Centinaje, Acting Chief, RPCRD and PSupt. Edilberto V. Aban, chief, RCEO attended the Coordinating Meeting with EV-ICON and other Radio Groups in Tacloban City on October 18, 2014 at EVSU, Tacloban City as preparation for the Pope’s Visit next year. CAMP RUPERTO K KANGLEON, Palo, Leyte – Police Regional Office 8 is initiating meetings with stakeholders, Brgy. officials, radio groups and set security plans for the coming of Pope Francis next year from January 15-19 to ensure the peace and order of the momentous event. PRO8 Regional Director, PCSupt. Henry P. Losañes expresses his optimism that Pope’s Visit on January will be very peaceful and orderly one. He said that augmentation forces which are approximately three thousand PNP personnel to include personnel who are handling administrative functions will be deployed to secure the safety of the Pope and other visitors, both domestic and international. Aside from PNP personnel, force multipliers, radio groups, stakeholders and Brgy. officials are expected to help in the security preparations thru communication. The PNP is helping in the mobilization of government resources to ensure the smooth and orderly visit of Pope Francis in the Philippines early next year. Series of coordinating meeting with stakeholders, radio groups, force multipliers and other Brgy. 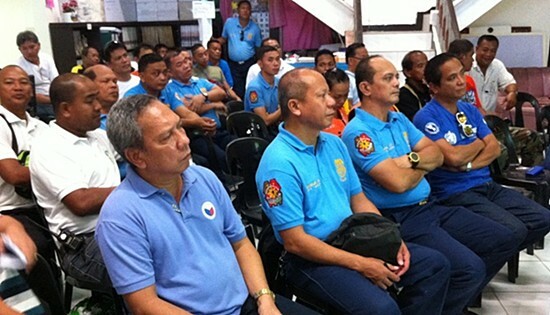 officials were initiated by the PNP for them to be mobilized during the Pope’s visit. Prior to this, the National Government issued a Memorandum Circular 72 creating the Papal Visit 2015-National Organizing Committee (PV-NOC) for the state visit of the Roman Pontiff on January 15-19, 2015. As instructed, all heads of the different government departments, local governments as well as the private sectors are encouraged to participate and coordinate all efforts to make sure that the visit of His Holiness in our country next year will be well organized and peaceful. The PNP is tasked to take up all sectors participation and responses in connection with the visit of the Pope, and ensure efficient coordination among public and private sectors, particularly with peace and order; and the traffic management plan for the transportation of persons and goods during the event. The Central Committee of the Catholic Bishops Conference of the Philippines (CBCP) is at the helm of managing and coordinating all religious and civil plans and activities of the Papal Visit. There are two local Executive Committees – Execom-Manila and Execom-Leyte – in the areas of engagement of His Holiness Pope Francis. The Execoms will serve as the on-site full-time, day-to-day operations arms of the PV-NOC. The Execom-Manila will be led by an Undersecretary in the Office of the Executive Secretary (OES). Its members will include the Undersecretaries of the DFA, DND, DILG, DPWH, DOH, DOTC, DOT, and PCOO; Chief of the Presidential Protocol Office; representatives from the OP, the Armed Forces of the Philippines (AFP), the Philippine National Police (PNP), and MMDA; Manila International Airport Authority (MIAA) General Manager; Presidential Security Group (PSG) Commander; and head of the Radio-Television Malacanang. The Execom-Leyte, on the other hand, will be led by an Undersecretary in the OES with members including the Regional Director of the PNP, Commander of the AFP Central Command, Regional Directors of the DOTC and DPWH, PSG Security Task Action Group Commander-Leyte, and a representative from the Radio-Television Malacanang. PCSupt. Losañes said that continues coordinating meeting with other stakeholders will be ongoing to ensure the peace and order during Pope’s Visit. PASAY CITY – The Senate Committee on Finance will scrutinize the multibillion proposed allocation for monitoring and evaluation of government spending, which eats up a big chunk of the proposed spending package of the government. Sen. Chiz Escudero, chairman of the Senate finance panel, said he finds most of the monitoring budgets and cost of service of many agencies too steep, like in the case of the Department of Social Welfare and Development (DSWD) which allocated P4.2 billion to implement, monitor and evaluate its project under the conditional cash transfer (CCT) program. The welfare department is seeking a P108-billion spending package for 2015, of which P64.7 billion is for CCT. Of this amount, P57.1 billion will go to actual cash transfer, P3.3 billion to personnel services and P4.2 billion to implement and monitor the DSWD’s cash dole out program. Escudero, however, said money set aside for “monitoring and evaluation” is too expensive. According to Escudero, the funds can be used instead to finance disaster preparedness and relief operations, and to purchase relief goods with longer shelf life. Last month, Escudero also quizzed the Department of the Interior and Local Government (DILG) for the P840 million it plans to earmark for monitoring and evaluation of its program under grassroots participatory budgeting process or the GPBP amounting to P5.7 billion, and sought a detailed breakdown of its projects and programs in all 1,600 local government units across the country. “The finance committee is seriously looking into these items in the budget and we are carefully studying initiatives to introduce sensible spending in all levels. We want to allocate our scarce resources and equitably and fairly utilize these for significant purposes,” the senator added.